In its order entering summary judgment in favor of FHKC, the trial court concluded that a child must meet the financial eligibility component and be a special needs child in order to be eligible for CMS. The trial court supported its decision based on the difference between the words "eligible" which appears in section 409.814(3), and "participate" which appears in section 409.814(5). 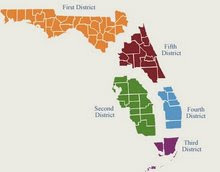 However, the trial court's conclusion is refuted by the language set forth in section 409.814(5) which states that a child with a family income above 200% of the federal poverty level may participate in all of the Florida KidCare Programs, excluding the Medicaid program. This language necessarily leads to the conclusion that the only component of the Florida KidCare Program that a child with a family income level above 200% of the federal poverty level could not participate in is the Medicaid program. When read together, sections 409.814(3) and (5) authorize an eligible child with special needs and a family income exceeding 200% of the federal poverty level to participate in CMS. As such, pursuant to the parties' contract, Child Doe #3 should not have been placed in the FHKC program, but rather, should have been referred to CMS as a special needs child. Accordingly, the trial court erred in ruling otherwise.